With over 20 years of experience in the rental of cars and vans, we offer economic rates, as well as a variety of categories to choose the best option that suits your price range and travel needs. For your next trip to Tulum, with the cars and trucks from America Car Rental, you can drive, explore and make the most of this paradisiacal destination in the Riviera Maya and its beautiful surroundings. From the white beaches of the Caribbean Sea to the theme parks in the area, or touring Tulum to visit a client or attend an event. When renting a car with America Car Rental, move and drive freely in Tulum and Riviera Maya without having to wait for public transport, which is virtually non-existent in the area. 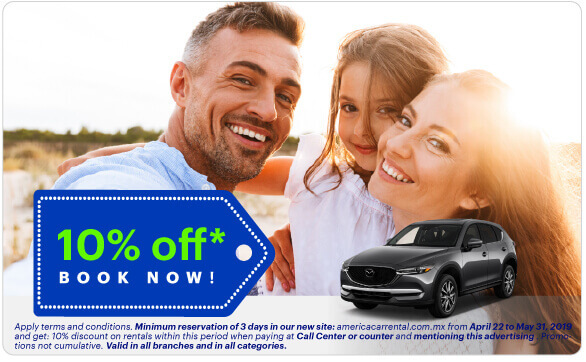 For your comfort, we are available 365 days a year at our Tulum car rental branch, so you can easily rent at America Car Rental. 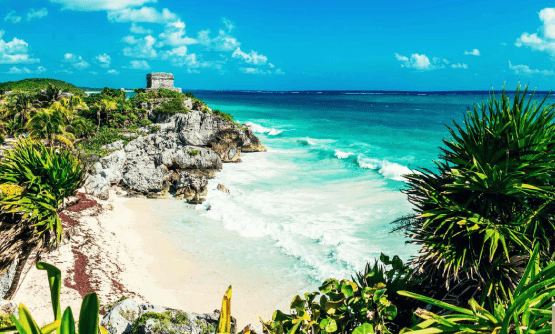 Tour the town of Tulum. Visit the archaeological sites of Tulum, Coba, and Muyil. Tanning on the beaches of fine white sand. Enjoy fresh seafood at the seashore. Explore the Sian Ka'an Biosphere Reserve (protected by UNESCO). Cenote Del Maya Dzonoot, means "Hole with water". Gran Cenote, perfect for diving and snorkeling. Cenote Carwash or Aktun - Ha, semi-open, you can snorkel and dive (only certified divers). Cenote House or Cenote Manatí, located very close to the sea. Cenote Zacil Há, with shallow waters and crystal clear waters, is connected to the Carwash and Calavera cenotes. Cenote Dos Ojos, of great depths, to which more than 67 kilometers of subterranean routes have been discovered. Enchanted Cenote, surrounded by mangroves and open, 5 to 10 meters deep. Mamitas beach (in the heart of Playa del Carmen, 65 km from Tulum). Punta Maroma (80 km from Tulum). Beaches in Akumal (25 km from Tulum). Beaches in Xpu-ha (35 km from Tulum). Beaches in Chemuyil (20 km from Tulum). Beaches in Sian Ka'an (55 km from Tulum). Pick up the car at the Cancun airport since there is no airport in Tulum. Let us assist you and offer you a fast and efficient service at our America Car Rental Tulum branches. 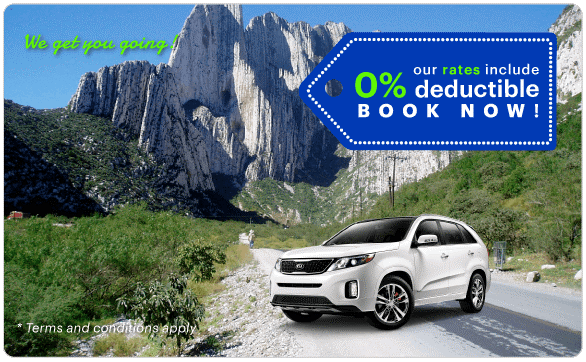 It is VERY Easy to rent a car or van in Tulum! We have the perfect ones for you!